So far, I haven’t written anything about Philippine politics. I did it deliberately because plainly, I do not like politics. It’s boring. It’s nasty. It’s full of BH. However, I write this because there are some things I want to get out of my chest with regard to our newly inaugurated country president. So bear with me. 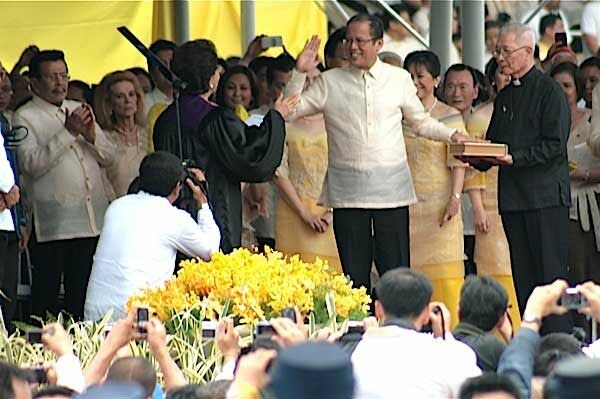 Last June 30 was the inauguration of the Philippines’ 15th president, Noynoy Aquino (more commonly known now as PNoy). Im not a fan. I feel that having famous parents do not make one an automatic qualified president. So far, as an ex-Senator, there wasn’t any fabulous law that he passed nor has he done anything extra ordinary for the country. I felt he won because he has Philippine hero for a father and a Philippine icon and an ex-president for a mother. For a country whose people watch numerous telenovelas every single night, he may be their salvation. Like father, like mother, like son. Hopefully. It didn’t disappoint. I (together with the rest of the world) saw how the former president made deadma the incoming president all throughout the program (except for the really plastic handshake and smiles that they were required to do). I don’t blame her. She will be investigated regarding tons of things once Noynoy is president. Anyways, for his inaugural speech, I was impressed. You can read it here. No more corruption. No more power tripping. An honest and simple government. Okay good. I hope he stays true to what he said. We will see. I am happy he banned everyone to use a wang-wang. A wang-wang is a Filipino slang for the car siren usually used by VIPs and emergency vehicles such as ambulances. This made me happy. I hate it when there are people who use these sirens and act like kings of the road. The weird thing here is apart from declining to use the official presidential sedan, he also declined to use the siren (which by law he is entitled to use), when he goes out of the palace. He wanted to set an example, he said. He also doesn’t stop at stoplights on their way to appointments. Now that is crazy. I know he wants to set an example but not only that he is endangering himself but also he is endangering especially all his presidential guards and members of the convoy. They are all out there like sitting ducks waiting to be shot. Seriously. Wanting to die for your country is one thing but taking other people with you is just not right. His presidential guards and other members of his convoy have families too. They’d be devastated to lose their loved one because their boss just wanted to prove a point. He should know that. Stopping at traffic lights when you are president is a crazy idea. Safety issues. How could you maximize your service for your countrymen if you’d be ambushed early?! Seriously. Also, as the country’s representative, you shouldn’t be late. Last Friday, because of traffic, he was an hour late for a turnover rites at Camp Aguinaldo. Imagine all those military people standing under the heat of the sun for an additional one hour because the president didn’t wake up early enough and did not use a siren and participated in the Metro Manila rush hour traffic. Crazy. Anyhow, I hopes he reconsider his use of siren. He can ban all others but he NEEDS to use one. I dont think they will take that against him, right?